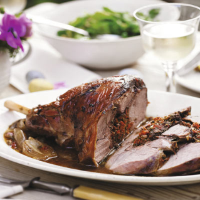 Add some Mediterranean sunshine to the Easter table with this citrussy, garlicky, rub with sundried tomatoes and anchovies, slow-cooked into a lovely leg of lamb. 1. Preheat the oven to 200ºC, gas mark 6. Make the stuffing by combining the capers, anchovies, lemon zest, sundried tomatoes, garlic and parsley in a mixing bowl. Mix together thoroughly. 2. Place the lamb in a roasting tin. Make a dozen or so deep cuts into the fleshiest parts of the leg and stuff each cut with as much stuffing as you can, until it's all used up. Turn the lamb over and rub the oil all over the skin. 3. Cook in the middle of the oven for 30 minutes, until the skin is golden. Add the shallots and stock to the bottom of the pan and cover well with foil – make sure the lamb is completely sealed in. 4. Reduce the oven temperature to 160ºC, gas mark 3 and cook for a further 4 hours. Remove the lamb from the oven, taste the sauce and season. Slice and serve hot. This recipe was first published in Mon Mar 04 15:32:00 GMT 2013.